Welcome to the Friday world news update from “Hawaii Intelligence Digest”. Views expressed in this geopolitical news summary are those of National Public Radio , its reporters, and its correspondents. Accessed on 09 February 2019, 0310 UTC, Post 942. Here’s what we’re following today. Amazon CEO Jeff Bezos is accusing the National Enquirer of extortion and blackmail. Bezos says executives for its parent company threatened to publish potentially embarrassing personal photos of him if he did not stop a Washington Post investigation into how the tabloid obtained private photos and texts. AMI is denying the accusation and says it did not break the law. Virginia Senate Majority Leader Tommy Norment joins an ever-widening scandal about past displays of racism that has engulfed the state’s top Democrats. Norment was the managing editor of Virginia Military Institute’s 1968 yearbook, which includes photos of students wearing blackface and people holding Confederate flags. Humanitarian aid has arrived for Venezuela – but Maduro is blocking it. The military, which backs President Nicolás Maduro, has barricaded a bridge from Colombia. Opposition leader Juan Guaidó, along with the U.S., is demanding that the aid convoy be allowed to pass. The Arizona facility where an incapacitated woman was raped and gave birth is shutting down. Hacienda HealthCare officials said they couldn’t continue running the facility, which serves children and young adults with intellectual disabilities. State officials criticized the decision, arguing it wasn’t in the best interest of the 37 remaining patients. Baseball Hall of Famer Frank Robinson has died at 83. Robinson, the only player to win the Most Valuable Player award in both major leagues, was the game’s first African-American manager. Zimbabwe is in turmoil amid reports of unrest and a heavy crackdown. Human rights groups in the African nation estimate that security agents have killed more than a dozen Zimbabweans and wounded and arrested hundreds after three days of protests and labor strikes against a fuel price hike last month. Young girls, take note — try being brave, not perfect. Reshma Saujani runs the tech nonprofit Girls Who Code, which supports young women who want to work in the tech industry. She’s also known among feminist and tech circles as a force of nature, and she begins her new book Brave, Not Perfect by explaining that she wasn’t always fearless. Saujani details her days treading through a joyless job and finally, in her early 30s, running for local office. That anecdote doesn’t have an entirely happy ending: Her campaign belly-flopped with dismal election numbers, and the press turned against her. But Saujani says there was a different, more invisible kind of victory: She dared to fail. Houston, we have a warming problem. The year 2018 was the fourth-hottest ever recorded on Earth since modern record-keeping began in 1880. In fact, the hottest five years on record are the past five years. 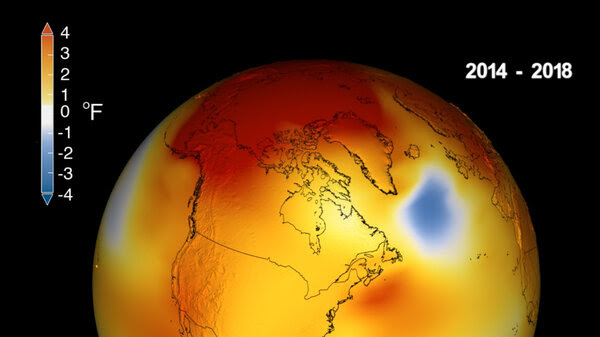 Gavin Schmidt, a climate scientist at NASA, says the message is clear: “The planet is warming. The long-term trends are extremely robust. There’s no question.” The changing climate also means more damage from natural disasters, which are increasingly costly to repair. According to a report released Monday, a third or more of the Himalayas’ glaciers could be gone by 2100 — melted because of Earth’s warming climate. And that could have disastrous effects on the water resources of some 240 million people who live in the Hindu Kush Himalayan region, which spans eight countries from Afghanistan to Myanmar and includes glaciers on some of the world’s tallest mountains, such as Everest. Nearly 2 billion people depend on the water that runs down from them in the HKH region. There’s so much ice collected in the region that it’s called the “third pole,” similar to the Arctic and Antarctica. Luxury brand Gucci has removed a sweater from store shelves and from its website following complaints about the garment’s resemblance to blackface. A team of scientists from MIT and Harvard have developed a system to deliver insulin that actually still uses a needle — but it’s so small you can swallow it and the injection doesn’t hurt. Why living near your grandma has evolutionary benefits. Marvin Gaye’s unreleased album from 1972, You’re The Man, will finally see the light of day on March 29, a few days ahead of what would have been Gaye’s 80th birthday (on April 2). Looking for more great content? Check out all of our newsletter offerings — including Music, Politics, Health and more!